Answer: The simple answer is: there are no truly cloudless nights anymore, at least not near major cities. Smog can scatter light same as a cloud. The image above was captured around sunset last year. The view is to the south toward Phoenix as seen from New River, about 30 miles north. The visible smog layer is about 200 feet thick. It gets even worse during winter inversions. This smog consists of particulate matter (dust and ash) as well as aerosols (tiny liquid droplets) from auto emissions, improperly applied pesticides and other sprays. All it takes to scatter light is a particle larger than the wavelength of light — around 0.5 microns (0.00002 inch) in size. The particles in smog typically measure up to 10 microns or more, and scatter light almost as effectively as a real cloud. 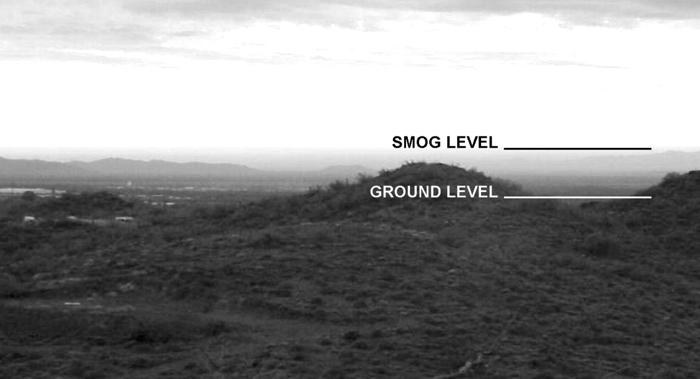 You can generally see farther through smog than you can through a cloud, but the gap is narrowing. So even on an otherwise fine “cloudless night,” you’ll still see the sky glow above major metropolitan areas. Dark sky is not (yet) officially recognized as a natural resource. That’s unfortunate, since it is, in a very real sense, finite, precious, and endangered.